Streisand sings jazz? Now this I gotta hear. What Barbra wants, Barbra gets. She wants to sing jazz. I’m a big fan of Barbra Streisand’s voice. What I’m not a big fan of are Barbra Streisand albums. 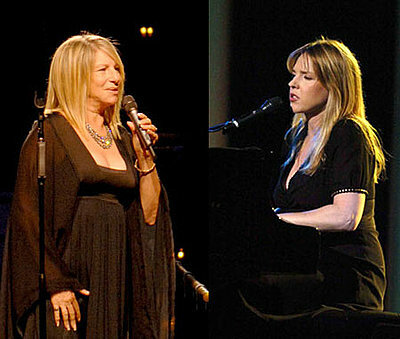 Streisand is blessed with what I consider one of the five best voices among female artists. The others being Aretha Franklin, Annie Lennox, Oleta Adams and Tracey Thorn of Everything But the Girl if you were wondering. One day I will make the case why Adams and Thorn belong on the list with their better known sister singers. Streisand’s albums tend to fall into one of two categories: bland pop music posturing and big booming Broadway showtunes. Both styles offer snatches of beauty and brilliance, but it doesn’t always make for a satisfying listening experience. While I admire Streisand as an amazing vocalist she seems to make great singles on otherwise mediocre albums. Since Streisand doesn’t write most of her material she’s dependent upon the songwriters she chooses. (I have a tough time believing there’s a producer in the world who could say to Barbra Streisand “Here, sing this”). Love Is the Answer (sort of a generic title, incidentally), is produced by Krall and she plays on it along with her quartet. Those are red flags, but I predict this will be Streisand’s show all the way. After all, who buys a Streisand album for the music? It’s her distinct voice that’s the steak and the musical accompaniment merely the sauted onions on top. Since I write about jazz for AllAboutJazz.com, I asked the editor if the site had received an advance copy for review. Apparently not, because Columbia doesn’t need to prime the pump for Streisand. Her base of support is vast and enthusiastic. If she wants to sing country, rap or the Manhattan phone book it will sell. What critics think of her slumming on the corner of jazz and ballads won’t affect the album sales one way or another. I’ll have to pull $14,99 from my own wallet if I want to review the album. The last Streisand album to enter my home was my wife buying The Broadway Album in 1985. Oh, the sacrifices I have to make for truth, justice and protecting the public from poseurs fakin’ the funk. Streisand has been making records since 1963 and has dabbled with everything from disco to soft rock, so an album of jazz standards was probably only a matter of time. It is a bit of a head scratcher that she waited so long to do it. More likely than not Love Is the Answer is a one-and-done for an artist who is both blessed with a magnificent instrument and plagued by finding a suitable challenge for it. Let’s put it this way. Watch LeBron James going through the motions during some meaningless game on the interminable slog that is the NBA regular season and while he’s not precisely going through the motions, you can see he’s not going balls out. If anything, James has to hustle just to keep himself interested when he’s playing against one of the many bottom-feeders of the league. Streisand can probably identify with James. Her own abilities so often overwhelm the material she has to work with and it makes me wonder what mind games she has to play to keep herself psyched up. Will Love is the Answer change my belief La Femme Barbra’s pipes or trepidation about the hit-and-miss quality of her albums? I’m open to the possibility that it might. There’s no possibility I’m going to change my mind that Diana Krall is an overpraised and underwhelming mediocrity. Some things I just won’t give ground on. When Babs meets Di it's a legend and a lightweight. ← Whitney and Mackenzie play the Victim Card with Oprah. I hear you on Krall. I just don’t get the appeal. But early in her career, Streisand reportedly made more interesting music. As happens all too often, she became blander as she became more famous. Yeah, Streisand had to appeal to popular audiences and submit to their will. I have not heard Streisand sing much jazz. but she does have an incredible voice.